Our company is also engaged in manufacturing best grade Automatic Form Fill that are used in various industrial applications. With the help of advanced machinery and experienced workforce we are able to design and develop highly effective machines. The raw material used in this process is procured from the most reliable vendors in the industry and we stringently follow international quality standards to process these products. Our products can also be customized as per the requirement and specifications of the customers. All our machines are offered to our customers at market leading price. 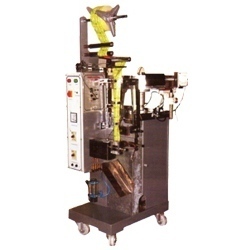 Europack Packaging Systems is one of the well established names in the field of Packaging Machines. With an aim to improve upon the prevailing packaging standards, the company has set up a strong R & D to take up any challenge. We also deal in the Flexible Printed and Laminated Packaging Material and Pouches (as per designs). We specialize in supplying various types of Packaging Machines for variety of products like spices, detergent powder, tooth powder, supari, pan masala, tea, coffee, biscuits, wafers, peanuts, hard boiled candies, soaps, tamarind bar, plum cakes, bun etc. We manufacture these products under the own brand name EPS. You name a product, it is our responsibility to provide you feasible packing solution. We do not only manufacture machines, but will provide an assistance to establish proper pouch size with respect to desired weight and to co.operate to develop packing material also with no extra cost. On individual order, we take extra care and test the machine to our satisfaction using original product and packing material prior to dispatch, in our factory. The machinery supplied by us is backup by skilled technical staff having over 15 years experience in this field, who are competent to provide an efficient backup service. We are majorly looking south Indian quires mainly from Chennai.